Skylight Play "I love you, I still love you but I'll never trust you." "I love you, I still love you but I'll never trust you." A while ago I went to my local cinema with a great friend of mine. 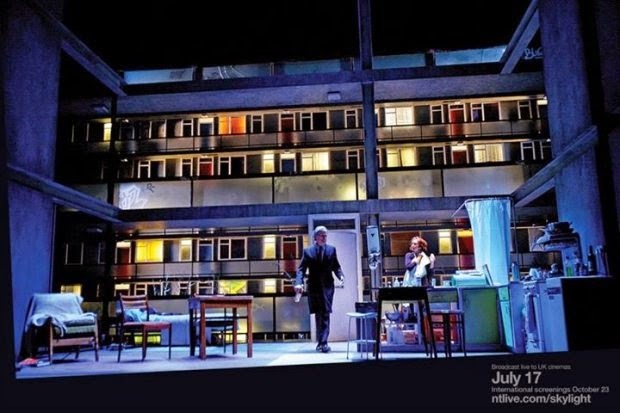 We saw the live production of the play Skylight directed by Stephen Daldry that was broadcasting live to loads of different cinemas on that night. I think all the theatre production plays should do this because it's a great way to get more people to see the play and also not everyone can afford to go to London all the time. I think someone should start a petition to get this happening because it's probably much quicker and cheaper to go to your local cinema to watch a theatre production play than London all the time. Don't get me wrong I love London but it's so expensive to get to especially if you want to see a play or a live show. I would also love it if they realise the theatre plays on DVD so you can watch it over and over again that might just be me though. 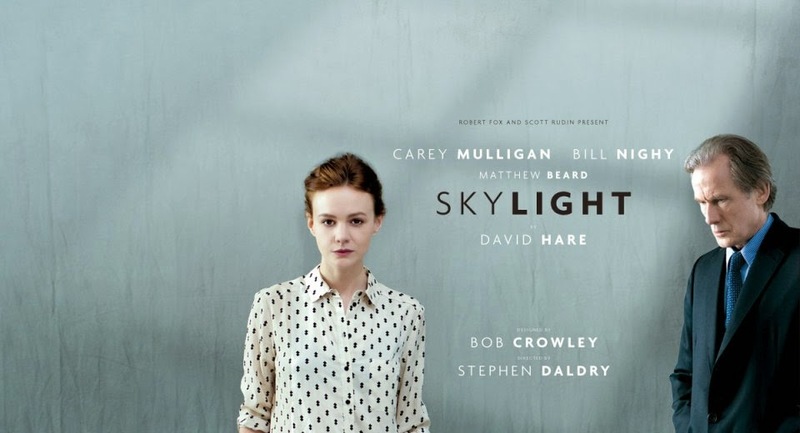 Anyway I saw the play Skylight which is about the lives of Krya Hollis a young schoolteacher played by Carey Mulligan and a older man Tom Sergeant played by Bill Nighy. She receives an unexpected visit from her former lover, Tom. He's a successful and also a charismatic restaurateur. His wife has recently died. In the evening the talk turns to their relationship the affair that they had. There's lot's of arguing between them and as the evening progresses, the two attempt to rekindle their once passionate relationship. Only to find themselves locked in a dangerous battle of opposing ideologies and mutual desires. The set location of the play is set in Krya's flat which I thought was so simple but I found it really interesting. As you can see it's a standard flat with a kitchen, a living area, a small bathroom, a bed and an eating area. I just thought it was a great set location for an interesting story. perfect. Bill and Carey's performances were just amazing I got lost in the play but in a good way. Also Carey's character has to cook a meal live in the kitchen which I found really interesting as I couldn't do it every night and I can't cook yet but I will learn soon. However to cook live and say your lines I know I wouldn't be able to do it. I just really loved the story of the play and within the script when watching the play I felt like I had known the characters their whole life. On the night I went to see the play I actually found out that the play was first shown in 1995 with Bill Nighy playing Tom Sergeant. So I thought it was really cool how they recast him in the reprised version, it just goes to show how good of an actor he is to play the part again. Overall I loved the play and would love to get the book. The play is surprisingly funny, dramatic, intense and intriguing. If you've seen the play let me know what you thought it. Did you see it live at the cinema? Or did you see it at a cinema?